Safe Deposit Boxes from International Vault allow commercial applications such as banks and hotels to securely store customer's valuables. Providing peace of mind and reliable security; our safe deposit boxes are built to the highest degree of quality, ensuring long term functionality and high resistance to potential attempts at theft. 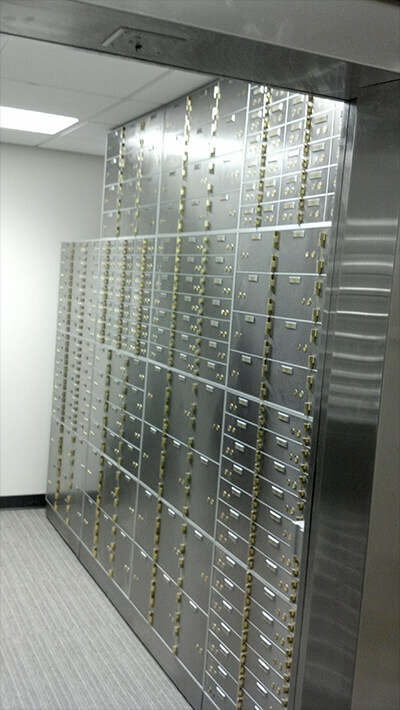 Bank deposit boxes and commercial safety box designs from International Vault conform to UL 608 ratings. Learn more on our UL Standards page. International Vault offers safe deposit solutions to protect valuable documents, heirlooms, and more. Precious metals, jewels, and cash. Stocks, bonds, and other financial paperwork. Collections of coins, jewels, and rare stamps. Documentation, including deeds, wills, titles, adoption records, and more. At International Vault, our mission is to keep your wealth secure and provide peace-of-mind when it comes to the safety and security of critical documents and personal possessions.